Music Mondays criteria include… being music. 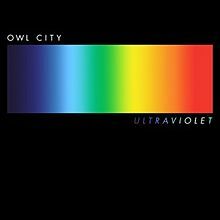 Owl City, (one-man band Adam Young,) recently released an EP, titled Ultraviolet, on June 27th. It runs about 15 minutes, and has four songs, “Beautiful Times,” featuring Lindsey Stirling, (another artist I enjoy listening to,) “Up All Night,” “This Isn’t the End,” and “Wolf Bite.” I’ve listened to the EP a few times through, so let’s talk about it! “Beautiful Times,” featuring Lindsey Stirling, is about a guy finding hope in the midst of his depression. It’s actually a great song, and probably my favorite one on the EP. The addition of Lindsey Stirling on her violin doesn’t hurt either. There’s a reference to a drug high, but it’s Owl City, so it’s more of a passing thing rather than the norm. “Up All Night” is about the heartache and pain in the aftermath of a obviously heartbreaking breakup. This is probably the single heaviest (not overly depressing, just heavy,) track on the EP, without really any of the normal notes of hope found in Owl City’s music. “This Isn’t the End” is about an eight year old girl dealing with her father’s… suicide. Yup, we just got a song about suicide from Owl City. Unlike other places you might look though, it’s not treated as a good thing, and actually, it’s treated as really pretty selfish. (Lyrics say things like “The role of a father, he never deserved/He abandoned his daughter and never returned.”) Toward the end of the song, Young says that eventually, the girl in question was able to forgive her dad and start healing emotionally. Aww. Even here, we have hope. Still, it’s probably the single most depressing track on the EP. “Wolf Bite” is, at its core, about fear and anxiety. Definitely something we can all relate to. And despite the title, it’s not a big monster mash. I enjoyed this track a lot. Not as much as Beautiful Times, but it’s definitely a favorite. Once you listen through the whole EP, you immediately realize that overall, it’s a bit darker than Owl City’s previously released albums and singles. However, you can still hear the hope in it. While I didn’t enjoy this EP as much as Owl City’s previous release, The Midsummer Station, (which was a full album,) it’s still a great EP. Adam Young is planning to release more EPs this year, and I’m definitely looking forward to them. Overall, I’d recommend this EP for 11 and up due to the sheer emotional heaviness of the tracks. Normally, I’d say Owl City’s good for 8 and up, with The Midsummer Station being about 10 and up. Owl City’s staying innocent and really pretty fun, and I don’t see that ever changing, but it’s slowly edging up in emotional impact levels. Alice in Wonderland is a story that most people will remember – little girl falls asleep, falls down a rabbit hole, wakes up in Wonderland, has adventures, gets on the bad side of the Queen of Hearts, and then wakes up in the real world. This movie takes that story and, quite frankly, makes it even crazier. Spoilers ahead! They argue over her identity as Alice, (she’s insisting that she is,) and finally take her to Absolem the Caterpillar, to consult his Oraculum (the Wonderland equivalent of a book of prophecies,) to see if she’s the one to slay the Jabberwocky. (Which turns out to be a huge dragon.) She’s not thrilled about that, as they didn’t mention that in the job description, and she’s not particularly interested in slaying anything. Absolem tells them that she’s not Alice yet, and disappears in his little cloud of smoke. The group is horribly disappointed, and is arguing over what they’re going to do, (since the Frabjous Day isn’t too far off,) when the Knave of Hearts and his group of card soldiers, along with the Bandersnatch (which looks like a big, furry pit bull,) attack and capture the Dodo and the White Rabbit, along with the Oraculum. The Dormouse makes off with one of the Bandersnatch’s eyes, but not before it gives Alice a rake with its claws, giving her some nasty scratches on her arm. The Tweedles run off with Alice, where they’re captured by the Jubjub bird, and taken to the Red Queen’s palace, leaving Alice alone. The Red Queen is alerted to Alice’s presence in Wonderland by the Knave, who then releases Bayard the Bloodhound to find her. Alice wanders for a bit, meeting the Cheshire Cat. He takes her to the Hatter and the Hare, who are both very mad and still having tea. The Hatter shrinks Alice further to hide her from the Knave. Bayard is on the Hatter’s side, however, and does not turn them in. After they leave, the Hatter volunteers to take Alice to the White Queen. Along the way, he tells her the story of what happened to put the Red Queen in power. They are followed by card soldiers, and the Hatter turns himself in to save Alice. She is then found by Bayard, who is no longer working for the Knave. He takes her (per her request) to the Red Queen’s castle, where she eats some of the magic cake apparently common in Wonderland, and grows to an absolutely ridiculous size, easily fitting into the Red Queen’s group. And of course, nobody recognizes her as Alice. Convenient. After a bit, Alice finds the Hatter, who has managed not to be executed, simply by offering to make the Red Queen hats to fit her. She chats with him for a bit, then wanders back off to go find the Vorpal sword (which looks pretty awesome, and is the only thing that can kill the Jabberwocky) which is locked away inside the Bandersnatch’s hut/cage thing. The Knave tries to flirt with Alice, but she’s not having any of that. One of the Queen’s court sees and tells the Queen, but the Knave is able to turn the tables, convincing the Queen that it was Alice’s fault. The Queen orders her beheaded. Alice, in the meantime, gets the sword, befriends the Bandersnatch (by returning its eye,) and the creature cleans Alice’s wound with its tongue. Eww. The Knave finds her, and attempts to arrest her. The Bandersnatch decides that it likes Alice better than its current living conditions, and Alice escapes on its back. Alice delivers the sword to the White Queen, who then shrinks her back to her proper size. The Cheshire Cat saves the Hatter from execution, and the Hatter tries to incite a rebellion against the Red Queen. The rebellion is quickly dispelled by the Jubjub bird, but the survivors flee to the White Queen’s castle, and both armies prepare for battle. Alice gets a pep talk from Absolem concerning her role as the White Queen’s champion, and then turns into a pupa. When the Frabjous Day arrives, both armies gather on a battlefield that looks suspiciously like a chessboard, and send out their chosen champions (armor-clad Alice and the Jabberwocky) to decide the fate of Wonderland in an epic battle. Alice fights the Jabberwocky, the two armies start battling each other, with the Red Queen’s side not doing terribly well. Alice beheads the Jabberwocky, ending the battle. The White Queen then banishes the Red Queen and the Knave to the Outlands; the Knave tries to kill the Red Queen (but the Hatter stops him.) The Hatter then does what must be the Wonderland equivalent of disco, and the White Queen gives Alice some of the Jabberwocky’s blood, which will take her home. 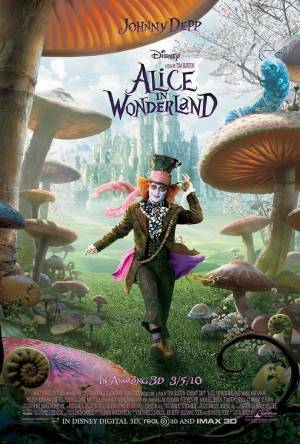 The Hatter suggests that she stay in Wonderland, but she decides to go home, promising to return. Alice returns home, where she says no to being married and says she’s going to live her life on her own terms. Lord Ascot is impressed, and takes her in as his apprentice with the idea of establishing trade routes to China. As the story ends, Alice is going off on a trading ship. A light-blue butterfly lands on her shoulder, which Alice recognizes as Absolem and greets him before he flutters away. Overall, this is a pretty good movie. I know that some people didn’t like it, but I actually really enjoyed it. Especially considering that it was directed by Tim Burton – it’s not that I have anything against him, his movies just end up being creepy and dark a lot of the time. Johnny Depp as the Hatter was a great decision. He’s a hoot. The world is definitely in a worse state than we last saw it. On another note, I still prefer the pink Cheshire, but the grey/blue one is pretty cool too. I don’t remember any profanity, and other that a couple of possibly gag or cringe-worthy moments, specifically when Alice is jumping across the moat on the heads of people the Queen’s executed, when she kills the Jabberwocky, and perhaps when the Dormouse pokes out the Bandersnatch’s eye, (which sounds worse than it is,) there’s not horribly graphic violence. I’d recommend Alice in Wonderland for ages 10 and up, probably. Maybe a bit younger. Depends on the kids watching. The movie is rated PG for “fantasy action/violence involving scary images and situations,” according to the MPAA, and for… a smoking caterpillar. As you might have noticed from previous Video Game Wednesdays, my gaming is pretty varied. I’ll play anything from Animal Crossing to Legend of Zelda, Professor Layton to Batman… and Myst (planning to write up a review of that… just as soon as I finish it) to LEGOs. 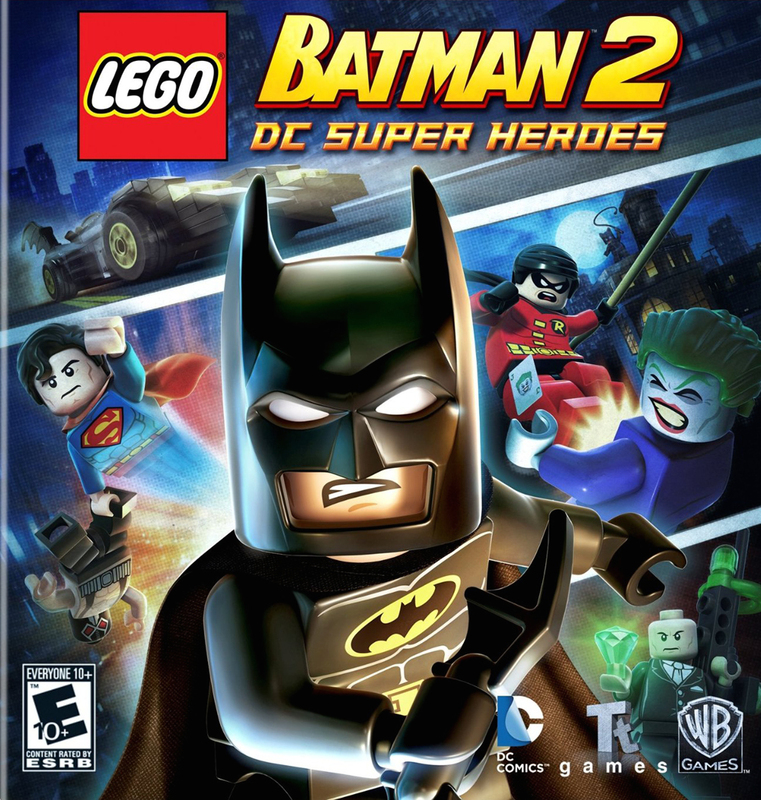 This is a pretty standard LEGO game, involving smashing anything and everything in sight for those shiny LEGO studs (the game currency) – except for the fact that it’s one of the LEGO games with dialogue, making cutscenes even funnier than normal. The story, (in a nutshell,) is a pretty standard Batman storyline – except it includes the Justice League starting about halfway through the game. Joker gets free, teams up with Lex Luthor, they plan to rig the election for president in Luthor’s favor (involving Joker laughing gas,) and Batman (with the help of Robin, who, for those of you wondering, is most likely Tim Drake, and the Justice League) stops them in a big final battle. Yeah, I could have gone a little more detailed, but with LEGO games… it kinda spoils the effect of watching the cutscenes and actually playing the game. If you really don’t want to play the game, you can always go on YouTube and find one of the cutscene recordings. People do record the cutscenes, patch them together and post it in one long video (depending on the game, the cutscenes alone run anywhere from an hour to two and a half.) It does spoil the game a little, since you’re not playing key parts of the story, but it does make for some entertaining viewing. The game itself, if you play to 100% completion (all levels, items, characters, bonus items, everything,) should take about 20-25 hours for a serious gamer. I’m at about 67% percent, and I’ve been playing for 16 according to the game. The controls are really pretty easy to learn and use, and there’s no penalty (minus losing a few collected studs) if you run and jump into a pit or off a cliff or otherwise die in an attempt to complete a level. Puzzles are pretty simple, and don’t generally require much thought, though teamwork between your playable characters is key. Because it’s a LEGO game, and everything is made out of bricks, everything just explodes into bricks or studs when it’s destroyed or defeated. No blood, no gore, nothing. Dialogue is all clean and funny. And if you know your DC superheros, there’s all sorts of funny shout-outs to other Batman/Justice League comics, games and movies. LEGO games (and the movie) excel at that. 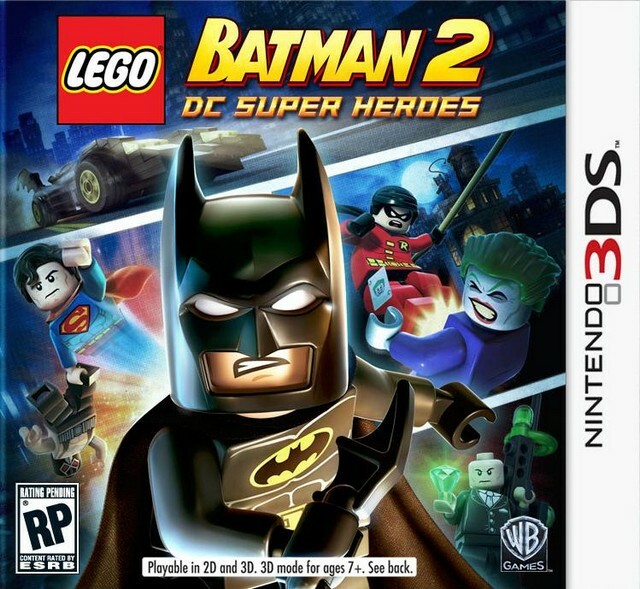 Basically, I’d recommend this game for LEGO fans, Batman fans… or if you just want something to play as stress relief. Bashing brick objects is oddly calming. And if you like the game, the third one is scheduled for this fall. And yes, I plan to play it. Because it’s Batman.